Nike and Apple are organising a 10 km race on August 31, encouraging runners to listen to music on their iPods as they complete the course in 25 cities around the world. In Australia the race is being held in Melbourne. Melbourne’s course for the Nike+ Human Race 10K will take in iconic Melbourne locations such as the Arts Centre, the MCG, the Yarra River, Federation Square, Flinders Street Station and the Collins Street business district. Commencing in Alexandra Avenue before joining with St. Kilda Road, the course then winds its way up Collins Street and around the Fitzroy Gardens before doubling back on itself, ending at the Sidney Myer Music Bowl in Kings Domain. 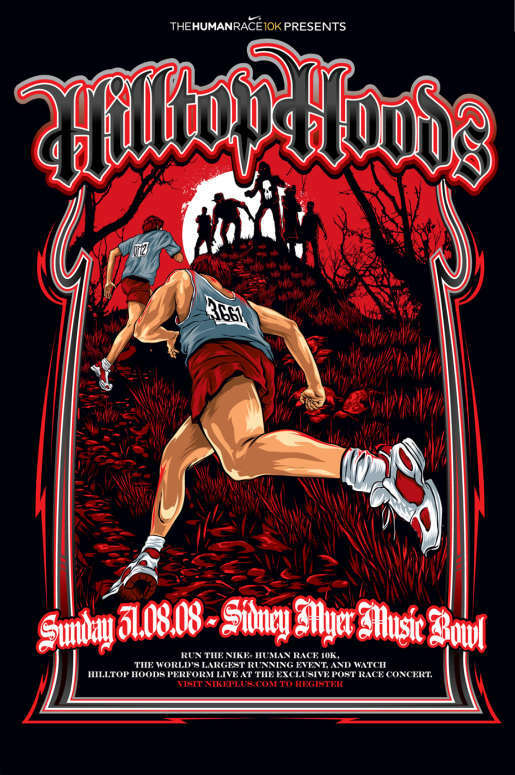 The race finishes with a massive concert featuring Adelaide hip hop group Hilltop Hoods and Sydney band Faker. The Human Race 10K Presents Faker. 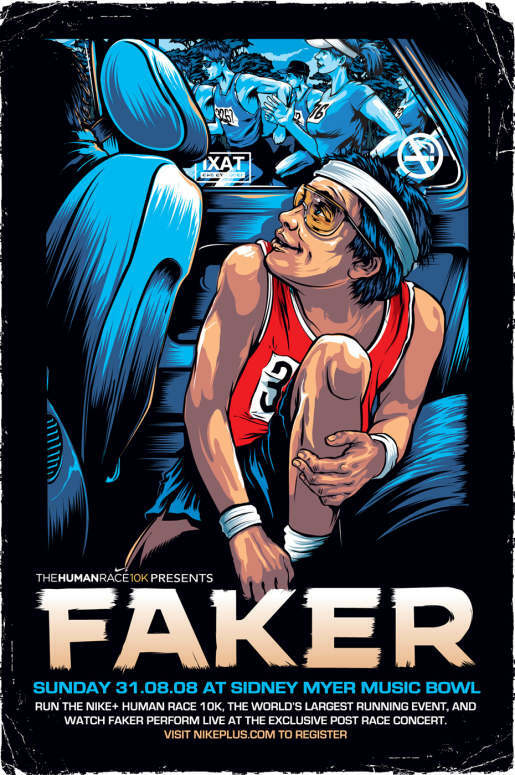 Run the Nike+ Human Race 10K, the world’s largest running event, and watch Faker perform live at the exclusive post race concert. The Human Race 10K Presents Hilltop Hoods. Run the Nike+ Human Race 10K, the world’s largest running event, and watch the Hilltop Hoods perform live at the exclusive post race concert. The Rock Star series was developed at Publicis Mojo, Melbourne, Australia by creative director/copywriter Leon Wilson, art director Christy Peacock, illustrator/typographer Ken Taylor.